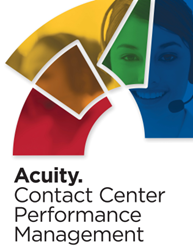 We are excited about being a part of Call Center Week this year... and look forward to showing conference attendees how easy it is to advance their performance management effectiveness with Acuity contact center software. TouchPoint One, provider of Acuity, the leading Contact Center Performance Management software, announced today that it will be exhibiting at Call Center Week (CCW), June 15-19, 2015 at The Mirage in Las Vegas, Nevada. Call Center Week is one of the premiere events for contact center industry leaders, drawing over 2000 attendees from across the globe. The event will feature action strategies, case studies and solutions for enhancing the customer experience, improving employee engagement and retention, and driving business results. Keynote and Master Class sessions will focus on key topics such as ”Enhancing Agent Environment through Technology”, “Breakthrough Thinking on Employee Engagement Strategies” and “Developing Standards and Strategies to Maintain and Improve Excellent Customer Experiences.” CCW’s Expo Hall will feature top technology solutions from over 200 sponsoring vendors. Acuity combines a central data store, intuitive business logic designer and specialized analytics engine to deliver real-time performance intelligence through customized scorecards, role-based dashboards and systematized workflows. Communication, gamification, quality monitoring, pay-for-performance and other features are tightly integrated and accessible anywhere via web-enabled work stations, pcs, tablets and smart devices. TouchPoint One will be located at Booth #213. Prizes will be raffled and open to all attendees throughout the weekend. Mention the code: 16CCW_TOUCHPOINT to receive your exclusive 20% off any conference packages. To schedule an Acuity demo and performance management needs assessment, complete the registration form here: http://www.touchpointone.com/resources_schedule.html or email TouchPoint One sales at info(at)touchpointone(dot)com. TouchPoint One is an innovative provider of contact center performance management solutions. The Company’s Acuity product is a hosted software solution (SaaS) that provides a single platform for improved contact center decision making, analytics and process execution to achieve greater customer, employee and business success. TouchPoint One and Acuity are registered trademarks of TouchPoint One, LLC. All other registered or unregistered trademarks are the sole property of their respective owners. © 2015 TouchPoint One, LLC. All rights reserved.